One of America's oldest museums is the National Museum of Health and Medicine near Washington. It opened 150 years ago as the Army Medical Museum during the Civil War. Now, it has a new building for its collection. Jim Curley organizes the historical objects, like microscopes from the 1860s. JIM CURLEY: "What I find so significant is, any given thing, they each have a very unique and interesting story and that's one of the great opportunities that I have in my job, to be able to explore them." The museum is especially popular with school children and health workers. They can get a close look at the human body -- like this leg swollen with elephantiasis. 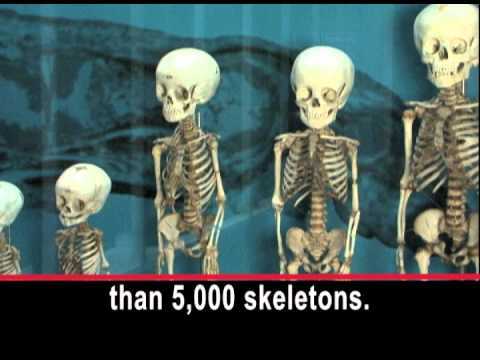 The museum has 25 million objects, including more than 5,000 skeletons. Tim Clark is the deputy director. TIM CLARK: "So, the skeleton is of one of our first animal astronauts. Abel was a rhesus monkey. She flew into space for a very brief period of time in 1959." Some objects have been used for medical research by the military, including the bullet that killed President Abraham Lincoln in 1865. Tim Clark says the museum teaches visitors about the medical discoveries of the military. TIM CLARK: "It became the lessons learned from the battlefield that taught the next generation of physicians and surgeons at the time as science of medicine was evolving rapidly." NATS: ANDREA SCHIERKOLK: "What we have here is a contrecoup injury." The museum's public programs manager, Andrea Schierkolk, is talking about an exhibit on brain injuries. ANDREA SCHIERKOLK: "This is something that we wanted to highlight through actual brain specimens that show these injuries so that people can visually understand what goes on with the brain, and how it is changed and why we have these resulting behavior and function problems." The museum seeks to promote the understanding of medicine -- past, present and future. I'm Christopher Cruise.